Head Injury | London, OH | Madison Pediatrics Madison Pediatrics | London, OH | We care about kids! Scalp Injury. Most head injuries only damage the scalp. Examples are a cut, scrape, bruise or swelling. 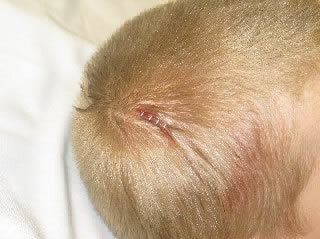 It is common for children to fall and hit their head while growing up. This is especially common when a child is learning to walk. Big lumps (bruises) can occur with minor injuries. This is because there is a large blood supply to the scalp. For the same reason, small cuts on the head may bleed a lot. 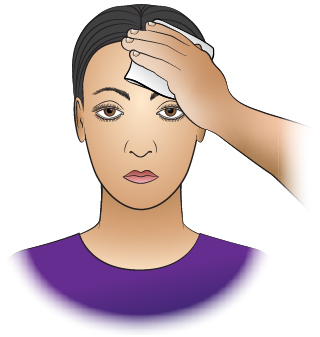 Bruises on the forehead sometimes cause black eyes 1 to 3 days later. This is caused by blood spreading downward by gravity. Skull Fracture. Only 1% to 2% of children with head injuries will get a skull fracture. Most often, there are no other symptoms except for a headache. The headache occurs at the site where the head was hit. Most skull fractures occur without any injury to the brain. They heal easily. Concussion. A head injury that changes how the brain normally works. It is usually caused by a sudden blow or jolt to the head. Most children bump or hit their heads without causing a concussion. The most common signs are a brief period of confusion or memory loss. This happens after the injury. Other signs of a concussion can include a headache or vomiting. Dizziness or acting dazed can also be signs. A person does not need to be knocked out to have had a concussion. Following a concussion, some children have ongoing symptoms. These can include headaches, dizziness or thinking difficulties. School problems or emotional changes can occur. These symptoms can last for several weeks. These symptoms are an emergency. If they happen, call 911. Treating a concussion requires both Physical Rest and Brain Rest. Brain rest means a gradual return to full studying and school attendance. Physical rest means a gradual return to normal activity, work and gym class. If symptoms occur (like a headache), the child needs to return to the previous level of physical and mental activity. In 24 hours, they can try again to take it to the next level. Athletes involved in sports need to have a stepwise plan for "return to play." Progressing through stages should be supervised by a doctor or athletic trainer. Not moving neck normally. Caution: protect the neck from any movement. 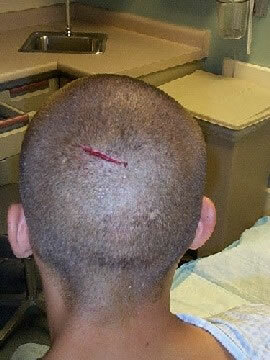 Most head injuries only cause a swelling or bruise to the scalp. Swelling of the scalp does not mean there is any swelling of the brain. The scalp and brain are not connected. They are separated by the skull bone. The skull bone protects the brain from getting injured. 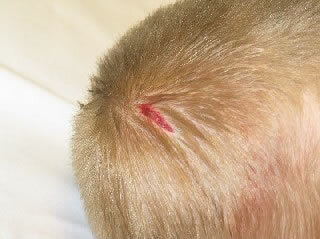 Big lumps or bruising can occur with minor injuries to the scalp. This is normal. Reason: the scalp has a large blood supply. The mildest brain injury is a concussion. Most of those also turn out fine. If there is a scrape or cut, wash it off with soap and water. Use a cold pack or ice bag wrapped in a wet cloth. Put it on any swelling. Do this for 20 minutes. Reason: Prevent big lumps ("goose eggs"). Also, helps with the pain. Repeat in 1 hour, then as needed. Watch your child closely during the first 2 hours after the injury. Have your child lie down and rest until all symptoms have cleared. Note: mild headache, mild dizziness and nausea are common. Allow your child to sleep if he wants to, but keep him nearby. Wake him up after 2 hours of sleeping. Check that he is alert and knows who you are. Also, check that he can talk and walk normally. Offer only clear fluids to drink, in case he vomits. Allow a regular diet after 2 hours. Exception: babies can continue breastfeeding or formula. Exception: Do not give until 2 hours have passed from injury without any vomiting. Caution: Never give aspirin to children and teens. Reason: Always increases risk of bleeding. Mainly, sleep in same room as your child for the first night. Reason: If a problem occurs, you will recognize it if you are close by. Problems include a bad headache, vomiting or confusion. Also, look for any change in your child's normal behavior. Option: If you are worried, wake your child once during the night. Check how he walks and talks. After 24 hours, return to a normal sleep routine. Most head trauma only causes a scalp injury. The deep headache usually clears in 24 hours. The scalp pain at the site of impact may last 3 days. The swelling may take a week to go away.